With a timeless buffalo plaid design this Mod-o-doc Tunic Dress brings a feminine flourish to daytime attire. 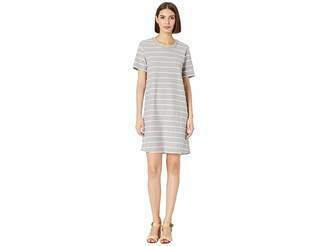 This effortless dress is crafted from a soft lightweight cotton flannel in a plaid design. Crew neckline with V-slit design. Long sleeves with buttoned cuffs. Pleated accent at sides. Button-down placket front. Front hand pockets. Gathering at the waistline lends a flattering fit. Straight hemline. 100% cotton. Machine wash tumble dry. Imported. Measurements: Length: 36 in Product measurements were taken using size SM (US 4-6).